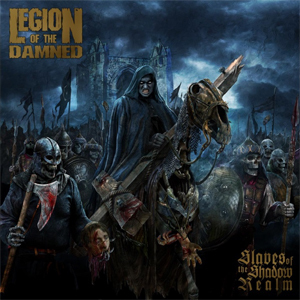 LEGION OF THE DAMNED Unleash New Video For "Slaves Of The Southern Cross"
If there is a band that'll break your neck from the sheer force of their music, it must be LEGION OF THE DAMNED! Now the Dutch thrash/death/black outfit releases their second single off their upcoming album Slaves of the Shadow Realm - watch the video for the crushing "Slaves of the Southern Cross" on KNAC.COM right HERE! "Next to "Dark Coronation", "Palace of Sin" and "Warhounds of Hades", this is one of my favorite tracks on the album: "Slaves of the Southern Cross", it's heavy as hell and sometimes reminds me of INFERNAL MAJESTY, it has a great atmosphere and I cannot wait for the fans to sheer with me "Slaves of the Southern Cross". For the video we rented the big hall of the Turbinenhalle in Oberhausen and kept it relative 'simple', spend the entire day in fire blasters and filmed the band that captures the essence of LEGION OF THE DAMNED: Aggressive and heavy!" "Shadow Realm of the Demonic Mind"